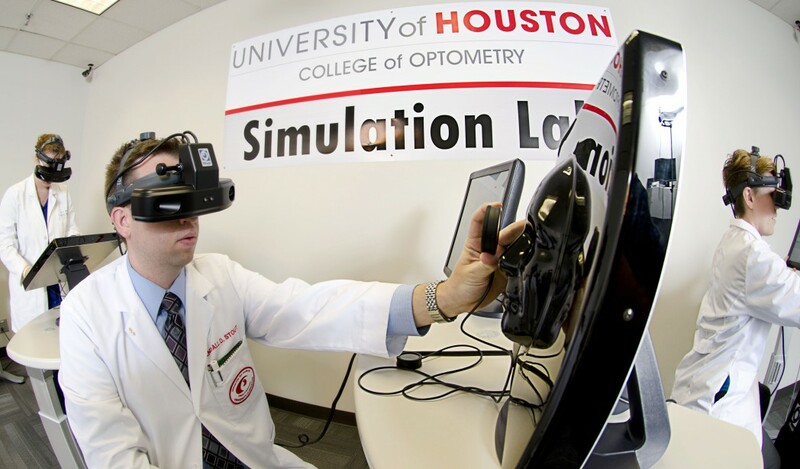 The University of Houston is elevating immersive and comprehensive learning for its optometry students starting this semester with a specially-designed simulation laboratory that is the first of its kind, in that it allows the students round-the-clock access to virtual patients. The newly launched Optometric Clinical Skill Simulation Lab is UH’s newest addition to an already top quality optometric program, which will no doubt better prepare aspiring optometrists for their actual clinical rotations. It is the first simulation lab to be designed for this particular course, and is the largest worldwide. Before the new simulation lab, and in many other academic institutions offering optometry, students would have to rely on fellow students to have an idea of how it is to interact with an actual patient. While this may prove sufficient in basic assessment techniques and history taking, learning on fellow students limits pre-clinical experience to healthy subjects. Additionally, since optometrists frequently need to induce dilation in patients’ eyes in order to assess retinal disease in the posterior structures of the eye, the student playing the role of the patient has to bear the effects of the procedure for a few hours after, which can get in the way of their own studies. This hi-tech learning experience is made possible through a modified headband-mounted light that allows for visualization of the retina via indirect ophthalmoscopy. While this is designed to resemble the actual headband used by professional optometrists, it is augmented with LED screens instead of plan oculars. The simulator also features a touchscreen computer that produces case files complete with images. Everything the patient learns about and sees in the lab are drawn from real-life clinical cases, and are simulated to respond realistically. The virtual patient will get tired, tear up, blink, close and move their eyes when the student is taking too long. Another plus to this laboratory is its 24/7 student access, which allows students to be flexible with their learning hours. After each simulation, the built-in software quizzes the student on what they have learned and does not allow them to progress to a next level or case until they have mastered the previous topic. It is also able to gauge how thorough and quickly the student was in examining the virtual patient’s entire retina, which can serve as an objective, more accurate means for their professors to follow their progress and mindfulness of the procedure’s time. Anderson shared that a number of seasoned eye specialists have come in to try the simulation, and they all commented on how realistic and natural it feels. For now, the lab is only open to optometry students in their sophomore year, but freshmen will soon be allowed access come Spring 2015. The lab will also work towards accommodating upperclassmen, and graduates. Anna is responsible for the scripting and production of video news content. Her skills as a registered nurse as well as a proven video content creator on YouTube and other social media platforms allow her to create video news reports that are engaging and easy to understand for patients.